BKNS Review 2019: Is BKNS a Good Hosting? Founded in 2010, BKNS is a leading Vietnamese IT company that provides web hosting, domain name registration, and a range of online solutions for both individuals and businesses. BKNS was founded in 2010 to help ease the growing demand for online services in Vietnam. Since then, they’ve carved out a reputation for themselves as a cheap and reliable web hosting service with enthusiastic support — and they’ve got the market share to prove it. Their data centers are located in Vietnam and are manned by a team of highly-skilled professionals. With BKNS, you get a number of tools to help you manage your website effectively. The first is the Softaculous one-click installer. With this tool, you can easily deploy scripts such as WordPress, Joomla, and Magento within minutes. Next, the LiteSpeed Web Server setup brings speed and performance to your web server, allowing your visitors to experience improved loading times. With BKNS’s cloud-based infrastructure, customers enjoy an above-average 99.99% uptime on their hardware and network — even with shared hosting plans. BKNS also makes use of a cloud storage system that’s twice as fast as a typical SSD and free from downtime caused by hardware failures. Each shared hosting account comes with an installation of cPanel as well: from the dashboard, you can easily setup your emails, upload files, manage your domains, and configure other add-ons. BKNS provides bi-weekly R1Soft backups with the option to recover your data whenever the need arises. Many users may find this too infrequent, however. 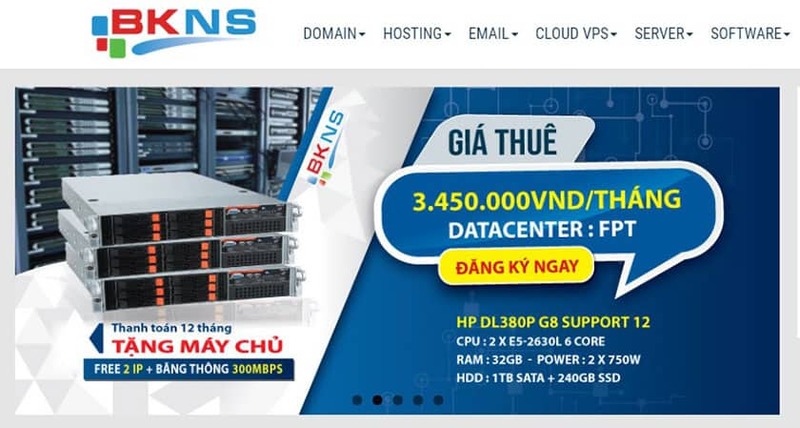 If you’re looking for a cloud VPS with easy initialization or dedicated servers with instant setup in Vietnam, BKNS might be one of the best options on the table. They offer reliable and scalable servers with cloud storage and a number of cores with Intel Xeon processors. You even get a free DirectAdmin license with the purchase of any of their VPS packages, so you won’t have to purchase a separate control panel license to operate your virtual server. Unfortunately, while you get unlimited bandwidth with all these VPS plans, BKNS only backs up your data every week, so you’ll have to make sure to manually backup your website before making any big changes. Standard and Enterprise Windows hosting with the Plesk control panel is also available for individuals who want to host Windows-specific apps. Powered by Windows Server 2008 Enterprise, they offer full support for ASP.NET, MSSQL, Microsoft Silverlight3/4/5, AJAX, and ASP. With this package, you also get a web-based file manager, backup and restore tool, and FTP access among other features. BKNS offers low-cost hosting packages and add-ons along with a good number of features. I’d have liked to see a website builder for beginners, but with the low prices they’re charging, I’m not complaining. You can choose between several billing periods with the shortest being a monthly contract, although in general, the cheaper your plan is, the longer you have to subscribe for to be eligible for their low rates. They only lock you in for a minimum of one year even with their entry-level plan though, so that’s not too bad. You can also try out their service for free for a whole month. Though support is in Vietnamese only, the BKNS technical support team is available 24/7. You can reach them through live chat or email, though the former isn’t available 24/7. They also offer telephone support to customers who require urgent assistance. They also have a FAQ section, though this isn’t comprehensive enough to resolve most issues on your own. BKNS offers scalable hosting packages on a reliable and high-availability cloud infrastructure. They’re surprisingly good value for money and are highly recommended for Vietnamese individuals and businesses. Wondering how BKNS stacks up against other Web Hosting companies? Enter any other Web Hosting company and we will give you a side-by-side comparison.